We were so excited to again be asked to host a #DisneyKids playdate, in conjunction with Disney Parks and a handful of other great sponsors! While we were provided some of the materials for the party, all opinions are our own and we were not otherwise compensated. If you’ve been around here long, you know we love planning and throwing parties. If you’ve been around my family even longer, you know that we love hosting themed anything, for any reason – or no reason at all. Some day I’ll get caught up on all of the party, dinner, and movie night posts that still need migrated from our decade-old family site. Until then, you can see a small sample of our previous #DisneyKids playdates and #DisneySide parties we’ve hosted in the past. We’ve had Cars treats and a Jake and the Neverland Pirates preschool playdate, a party featuring a variety of everyone’s favorite Disney Junior characters, and even one themed around the classic family fun found on Walt Disney World’s and Disneyland’s Main Street, U.S.A. This year, the timing of the Disney Kids parties and playdates lined up well with my son’s fifth birthday. 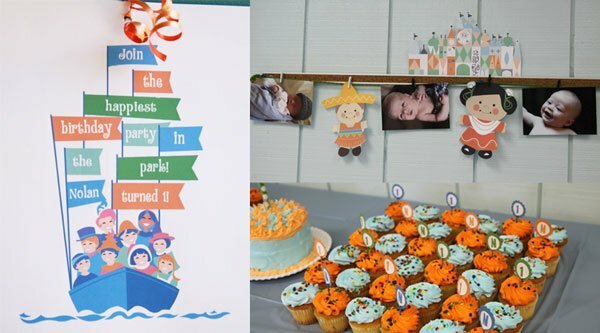 We had already started planning his Disney Cruise Line themed party, and were thrilled we would be able to so easily incorporate many of the fun Disney Kids elements. Read on to see how you can do the same with your choice of themes… then check back soon for our full Disney Cruise Line party report! For our family, this step is the most fun of any event planning; we literally have, at all times, a note synced on our devices with party ideas, captured as they pop into our heads. For some people, I know this part can be overwhelming. 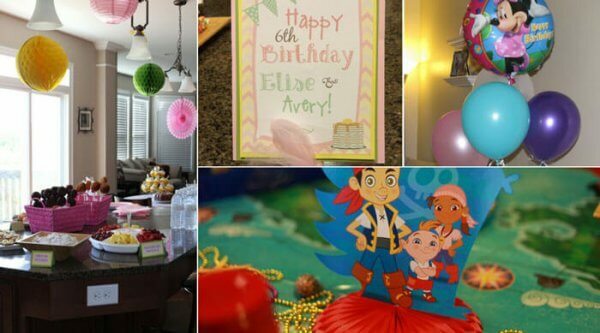 The awesome thing about Disney-themed parties is that the possibilities are endless! Last year, we had a Tsum Tsums party, even though there weren’t any commercial decorations available. It’s easier than you think to DIY a party, and save money doing it! In your brainstorming session, you might include your family members’ favorite characters, movies, attractions, or park – or maybe you want to do a party themed to Walt Disney World as a whole. This is especially fun for announcing a surprise vacation, hosting a trip planning get-together, or kicking your vacation off in style the night before a trip. 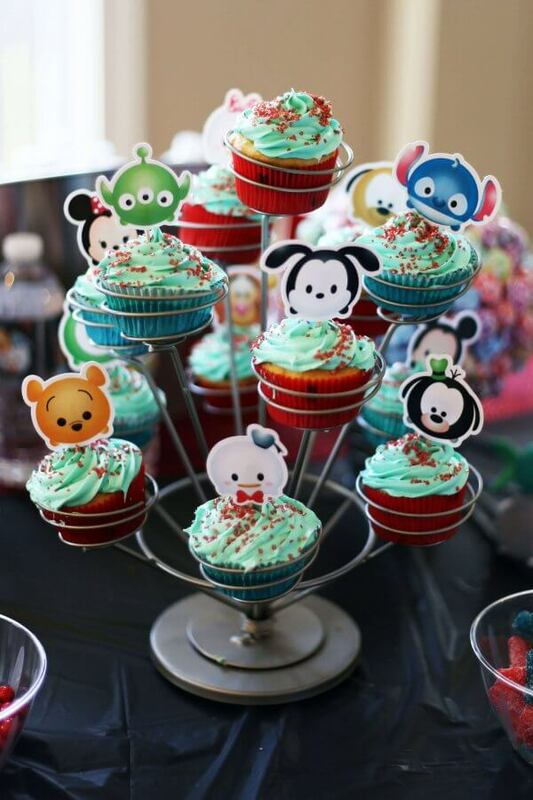 You can even choose a #DisneyKids party themed around your little one’s favorite attraction! We have found that the most effective way to decorate for a party or playdate – both cost-effective and visually impactful – is to choose just a few commercially created decorations at the most, and build the rest around your desired color scheme. Sometimes we’ve had a character-themed tablecloth anchor the decor, other times it’s balloons and hanging decorations, and other times still we haven’t actually been able to start with anything from the store. Sometimes our decor centers around a few commercially available pieces, other times it just begins with a color palette. As it turns out though, this allows for a lot more creativity and a lot less expense. Admittedly, it takes a little more planning – but it doesn’t have to in order to get the job done. 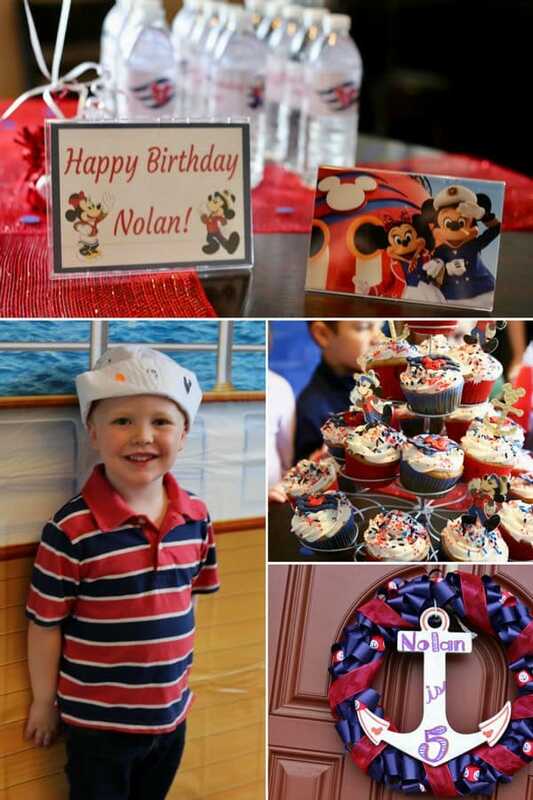 For my son’s Disney Cruise Line birthday, we went with the probably obvious color palette of dark blue, red, and “Mickey Yellow” – reminiscent of the colors on the hull of the Disney Cruise Line fleet. We added classic Mickeys, the DCL logo, and anchors, and a party came together nicely! A menu inspired by Walt Disney World rides including Country Bears Down Home Cornbread, Pooh’s Hunny Spread and Big Thunder Mountain Railroad “Coal” Slaw. 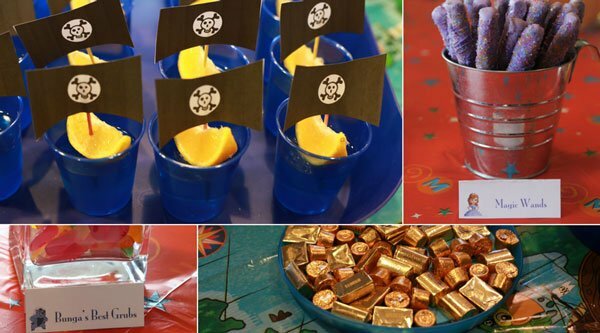 … and food inspired by a theme, like the princess, pirates, and jungle foods we’ve served to celebrate some of our favorite Disney Junior shows. Some foods support a theme such as these for age and the Neverland Pirates, Sofia the First, and The Lion Guard. Other times still, we’ve taken a common food and “assigned” it to someone to tie it together. 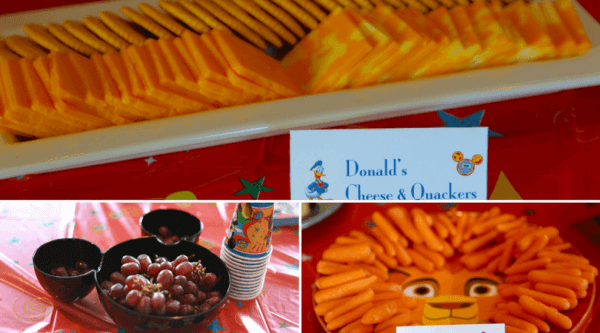 For example, a tray of cheese and crackers became Donald’s Cheese & Quackers. And let me be the first to say, sometimes kids will eat even better if you just stick some kid-friendly favorites in a dish that matches your color scheme or your theme! Sometimes, it’s easiest to just stick kid-friendly food in a cute container. No shame in that! 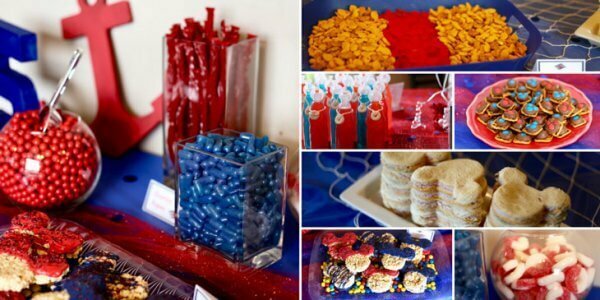 For this year’s Disney Kids party, we added a lot of Mickey-shaped (or Mickey-embellished) snacks, as well as a few cruise ship or nautical elements, such as gummy lifesavers (also known as gummy cherry rings), licorice ropes, and the “catch of the day” (aka swedish fish and goldfish snacks). When in doubt, add Mickey shaped food and accents related to your theme, such as a few nautical candies, or your color palette. The awesome team at Disney Parks that is focused on making magical experiences for the littlest guests, has shared with me (and you!) 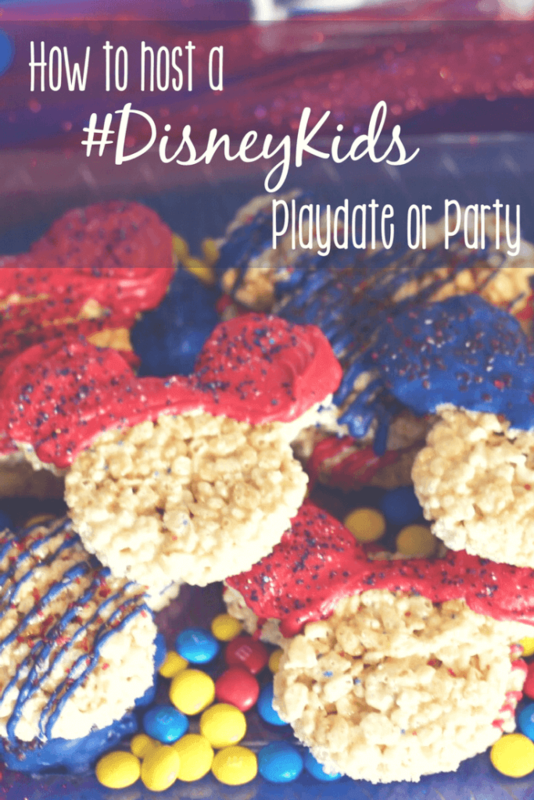 some super fun recipes for a Disney Kids preschool playdate or party. Check out their suggested menu here for Mickey Peanut Butter and Jelly Skewers, Copycat Disney Cinnamon Almonds, and our favorite, Pixie Dust Popcorn. You’ll also find the recipe for Mickey’s Magic Wands, which – as you saw above – can be customized to match your favorite character, attraction, or other Disney theme! This is where ingenuity has no limit! We’ve been working through months-long part planning routines since before Pinterest existed, but let me tell you something. Now that it’s here, why reinvent the wheel? 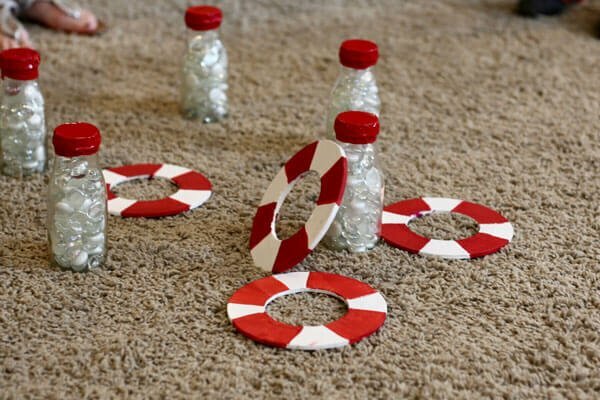 There are plenty of games and activities, such as our life preserver ring toss game, where you can just run with something that crosses your mind related to the party theme you’ve chosen. But if you’re unsure how to get started, I think you can find something on Pinterest for just about anything! 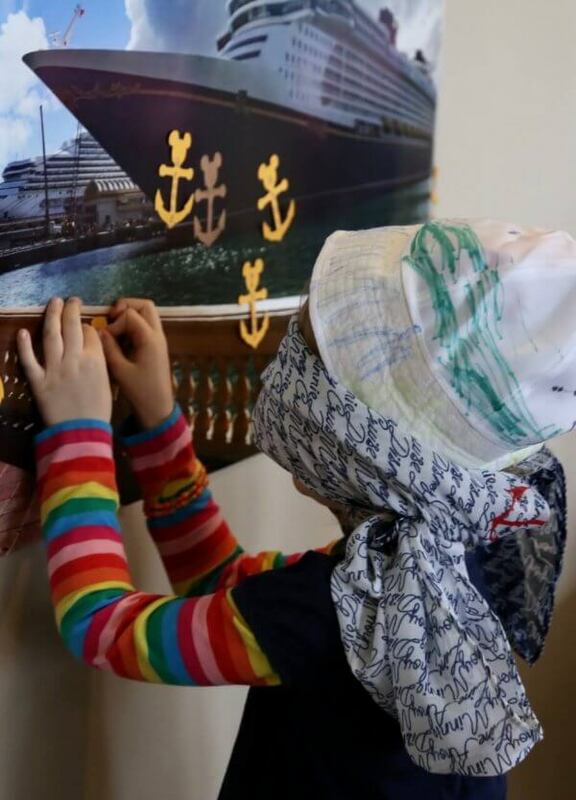 Our Disney Cruise Line party included the aforementioned ring toss game and a “pin the anchor on the ship” game, as well as a craft. We also utilized some games from Disney Parks, to share some of the same wonderful reasons to take your preschooler on a Disney Cruise or to Walt Disney World. For our purposes this time, the biggest hit was Character Charades – acting out many of the characters kids can meet on Disney Cruise sailings as well as in the parks. We also played Magic Match, which led to discussions about some of the kids’ favorite kid-friendly attractions at Walt Disney World. It was so much fun to relive or hear about some of the memories made in the parks, and I know it had to be encouraging to anyone on the fence about taking younger kids on a Disney vacation. 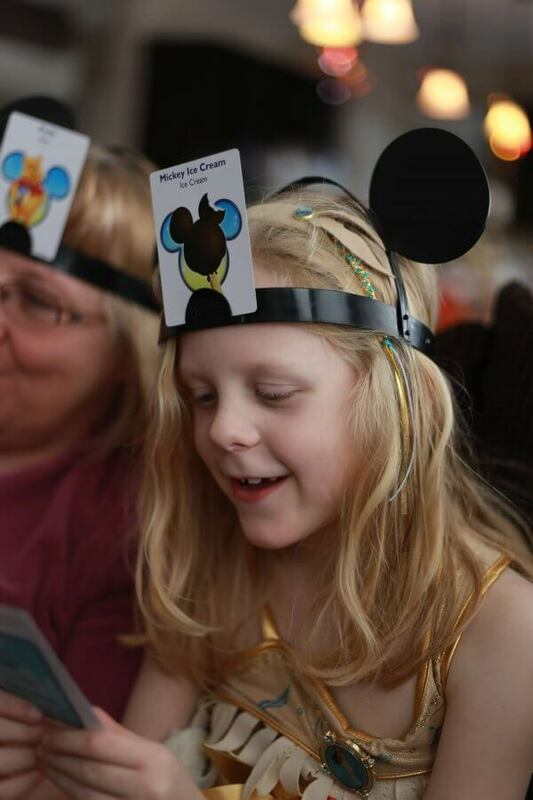 Disney Headbanz is a great alternative to some of the other character games featured here, if you don’t have access to a printer. 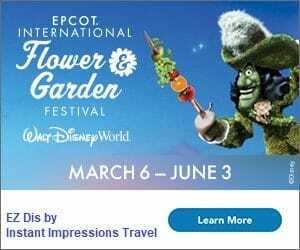 Disney Family has a really great site that gets updated regularly, which is helpful for planning Disney-centric events. 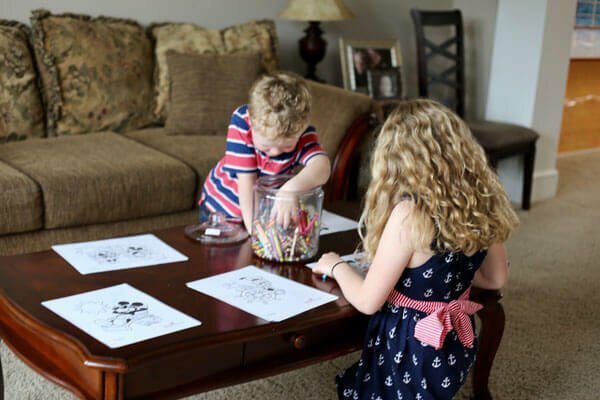 For example, right now it features Mothers Day and a Mickey & Minnie Camping Weekend, among so many other crafts, activities, games, printables, recipes, and anything else you might need for a Disney Kids party. And for actually planning a trip to Walt Disney World (or other Disney Destinations) with preschoolers, they’ve got you covered there, too. Check out the Planning Guide for Parents of Preschoolers for which attractions are must-dos for young guests, plus tips for your visit, how to maximize your benefits on the newly-redesigned My Disney Experience app, and answers to nearly every question you can think of. The sky is the limit with your next #DisneyKids themed event. Where will you start?! I’d love to hear about your parties below, or in our Facebook community!